LILONGWE, May 20 2013 (IPS) - Lloyd Phiri, a fisherman from Senga Bay on Lake Malawi’s shores in Malawi’s central region, knows that the lake’s water levels are dropping. He can see it in his catch, which has shrunk by more than 80 percent in recent years. Years ago, it was the norm to catch about 5,000 fish a day, Phiri says. But now, if he is lucky, he brings in one-fifth of that. And if he is not, he catches a mere 300 fish a day. “My fish catch has gone down in recent years and this has affected my earnings. I now have problems paying school fees for my children,” Phiri tells IPS. The rapid drop in Lake Malawi’s water levels, driven by population growth, climate change and deforestation, is threatening its floral and fauna species with extinction, says Malawi’s Ministry of Environment and Climate Change Management. And included among the wildlife threatened are the fish that Phiri depends on for a livelihood. “Over the last three decades some water balance models have been done on the lake and have shown that the water levels have dropped from 477 metres above sea level in the 1980s to around 474.88 metres currently,” Yanira Mtupanyama, principal secretary in the ministry, tells IPS of the 29,600-square-kilometre lake that straddles the borders of Malawi, Mozambique and Tanzania. “It’s a big deal because studies are showing that the water levels in the lake will keep on dropping in coming years because there are signs that show (that there will be) less rainfall and increased evaporation,” she says. An estimated 1,000 different fish species rely on the fresh waters of Africa’s third-largest lake for their survival, which also provides 60 percent of this southern African nation’s protein requirement. The mbuna cichlids species and the famous tilapia fish, locally known as chambo, are facing extinction. Chambo is Malawi’s most popular fish. The country’s Department of Fisheries says that fish stocks in the lake have dwindled by 90 percent over the last 20 years. It is a huge concern as, according to authorities, about 1.5 million Malawians depend on the lake for food, transportation and other daily needs. And of even greater concern are the recent Malawian government reports that say the water mass may hold rich oil and gas reserves. Environmentalist Raphael Mweneguwe fears that if oil and gas mining starts on the lake, it can lead to further biodiversity losses. “The fish stocks have declined in the last two decades from about 30,000 metric tonnes per year to 2,000 per year because of a drop in water levels, overfishing and rapid population growth. But this may get worse if oil is discovered on the lake,” Mwenenguwe tells IPS. Williman Chadza, executive director of the Centre for Environmental Policy and Advocacy, a local NGO that promotes activism on environmental issues, shares Mwenenguwe’s fears. “Oil is a resource of paramount importance to a country like Malawi, which is seeking revenue alternatives for its socio-economic development. But its discovery may deepen the country’s biodiversity loss and impact badly on water sources,” Chadza tells IPS. Mining also poses a threat to the lake. A uranium mine in Karonga, a town situated near Lake Malawi in the north of the country, is one example. The mine, owned and operated by Australian mining giant Paladin (Africa) for the past four years, is regarded as a pollution threat. “Uranium is a highly radioactive material and therefore there are still threats of polluting the freshwater in Lake Malawi,” Udule Mwakasungura, a human rights activist, tells IPS. The need to arrest the loss of biodiversity is particularly important in Malawi where people depend on biological resources to a greater extent than other parts of the world. 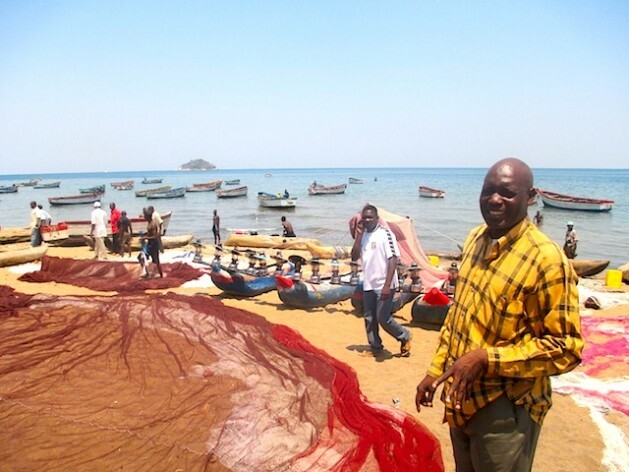 The 18,000 families of Nguwo fishing village in Senga Bay are an example of this dependency. “We know that the fish stock has depleted because of unsustainable fishing practices and non-compliance with fishing regulations … we also know that cutting trees unsustainably is ultimately affecting the quality of the water we drink,” says village headman Radson Mdalamkwanda. Mdalamkwanda tells IPS that fishermen in the village have been working together with local authorities in the district to address the threats and challenges facing the conservation of Lake Malawi. He says that anyone not following the rules or by-laws is banned from fishing on the lake during October and November, when the fish spawn. And for the past five years the village development committee has been going to local gatherings to educate residents about the by-laws and about the need to protect the lake. “Apart from protecting the fish, we also want to safeguard the water so that it’s safe for drinking. We do that by creating awareness at gatherings like weddings and funerals,” the chair of the village committee, Ibrahim Kachinga, tells IPS. Their efforts also complement the Malawi government’s attempts to address the threats challenges to conserving the flora and fauna of the lake. “There has been a ban for the last few years on the use of high-yield fishing gear in lake Malawi between October and November when the fish are spawning,” Mtupanyama says. Mtupanyama also says that in 2003 the government launched a 10-year strategic plan, which largely seeks to restore the lake’s fish stocks. “So for the last 10 years we have been restocking the lake with fish by breeding juveniles outside the lake and then reintroducing them into the lake. We haven’t done badly,” she says. Mtupanyama could not, however, say if this had significantly increased the lake’s fish stock. Regardless of what may come of this restocking project, the Nguwo village committee understands that the future of the lake is important. So they are educating those who can do something about it – the village’s future generations. The aid given by government over last ten years has not done the trick if fish catch is down by 80%. They will have to invest and quickly in fish farming and aquaponics on a large scale if they hope to meet needs of the future.